This Candy Cane Cheesecake Dip is easy to whip up and makes the perfect holiday appetizer or treat! In a bowl, whisk together the International Delight Peppermint Mocha Creamer with cheesecake instant pudding. Set aside for about 5 minutes. In a mixing bowl, beat together the softened cream cheese and sugar. Add in pudding to cream cheese mixture and beat. Once well combined, fold in the 1 1/2 cups of thawed whipped topping and refrigerate. 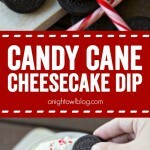 When ready to serve, fill bowl with Candy Cane Cheesecake Dip and sprinkle with crushed candy canes.